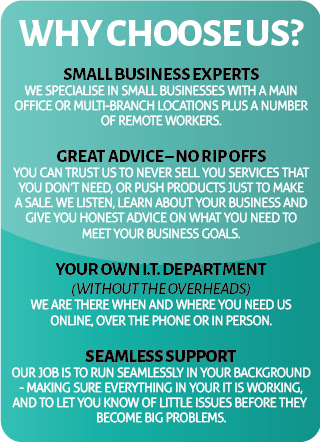 Small Business Experts – We specialise in small to medium businesses with a main office or multi-branch locations plus a number of remote workers. Great Advice – No Rip Offs – You can trust us to never sell you services that you don’t need, or push products just to make a sale. We listen, learn about your business and give you honest advice on what you need to meet your business goals. Your Own IT Department (Without the Overheads) – We are there when and where you need us online, over the phone or in person. Seamless Support – Our job is to run seamlessly in your background – making sure everything in your IT is working, and to let you know of little issues before they become big problems. Having IT hassles? Call us or drop us a line. For support questions we will get back to you within 2 to 4 business hours.